God is really unrelenting when it comes to how much He is willing to show us His love: we literally can’t escape it. And yet, how often do you find yourself feeling unloved? Alone? Empty? I know this is common to the human experience, and it saddens me. We have a love that so readily available, and we can still find ourselves in moments where we refuse to accept or recognize that love. Additionally, we don’t share that love as willingly as He has called us to. Sometimes I think it’s because we don’t feel a particular person deserves or has earned our love, but that’s ridiculous, because we know we have done nothing to earn the love God gives us. Scripture (and just simply living life) clearly points out the fact that we are all undeserving of the free and endless gift of love He gives us. So, I had to check myself and remember that I can’t hold out on loving if God isn’t doing that with me! The Lord put it on my heart to read 1 Corinthians 13 every day. I have been doing it for the last two weeks and I can’t explain how much it has opened my eyes. I am reading it in the Message version, and my goodness, ya’ll! It’s crazy how personal God can get when we let Him. I LOVE everything about this scripture, and it’s really doing a work on me. I want to encourage you all to read it as regularly as you want to, but perhaps you can join me in personally reading it every day this work week before 8 A.M. We all know God’s word can transform us in ways we never thought possible. What if He helped us to feel love and show love a little more freely? I know that’s what I am hoping for! Posted on January 22, 2014 Categories UncategorizedLeave a comment on How about Love? Do you dream at night? Well, that’s a silly question: we all dream at night! I guess the question should be, do you remember the dreams you have while you’re sleeping? I do, always! And let me be completely honest: they are always wild! Seriously: I love the world my brain has created in my sleep! In my dream last night, I started a new job at a restaurant like Chili’s or something, and on my first night they gave me 20 tables with no training and no idea what the expectations were. I got yelled at by my manager, I sold french fries to every table (even ones that were not my own) and I lost track of all of my orders. But for some reason, I was totally calm in my dream. I didn’t cry (which I probably would do in real life) or break a sweat at all. I had peace, for some reason I cannot explain, and I just kept walking up to tables and asking them if they wanted french fries. In my mind, I think I imagined that to be the best item on the menu (or, perhaps, the only one I actually knew on the menu!). Thinking about this dream last night reminds me of how God wants us to feel at ALL times: at peace. He offers peace to us in every single situation, but how often do we tap into it? How often do we continue to just walk forward and be about our “father’s business” without getting distracted by the scenery around us? In truth, I fail regularly. But I am realizing more and more that we have plenty of opportunities to “get it right” with each new day. And as you all know, our circumstances will forever be chaotic. I heard it said once that if you’re not going through a storm, you’re either coming out of one or about to go into one. Such a wonderful thought, right? But I love love love, how God makes it very clear in His Word that no matter where we are, He is with us. And where He is, so is His peace! So today, I want to encourage each of you to keep your head up, be about your father’s business, and by golly, if french fries are the best you have to offer, you better sell it with every thing you’ve got! Our worth was determined on the CROSS when Jesus sacrificed His life for us and died to set the final price value over our heads. So why is it so difficult to remember this when the world tells us that we are replaceable, unworthy, forgettable, and alone? Because the world (and Satan) work counter to God’s truth, and they have been programming our brains to believe lies that will never be true (and will never provide comfort or peace). Psalm 63 speaks about the soul being satisfied as with fat and rich foods. Do you know how you feel after a heavy meal? overwhelmingly stuffed, as if you cannot fit anything else inside of your body. That feeling can be duplicated in the spiritual sense if we are stuffed to the brim with God’s love for us. I want that feeling of satisfaction, and man cannot give it to me. I find (as an extrovert) I focus a lot of my thoughts on how I can spend more time with people, because that helps to fill my natural desire for human interaction. However, I sometimes catch myself having a fear of alone time that is not necessarily related to extroversion, but more closely related to my fear of being unloveable or unworthy of affection. The cure for these fears and lies is truly spending time with My Maker, and allowing him to saturate my being with His undeniable truth. I am enough, and nothing and no one can change that. 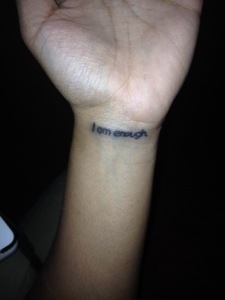 Posted on January 3, 2014 Categories UncategorizedLeave a comment on I am enough.